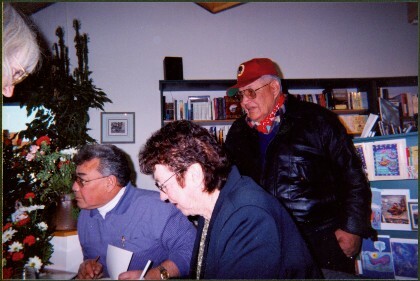 Photograph depicts Justa Monk and Bridget Moran seated at table, signing copies of 'Justa: a First Nations Leader'. Plants, bookshelves, two unidentified individuals also visible in image. Item is part of the Bridget Moran fonds. See also items 2008.3.1.22.8 and 2008.3.1.22.44 - 2008.3.1.22.51 for images featuring similar content. Stamped annotation on recto of photograph: "PG 13+01 NNNNN+14 030".